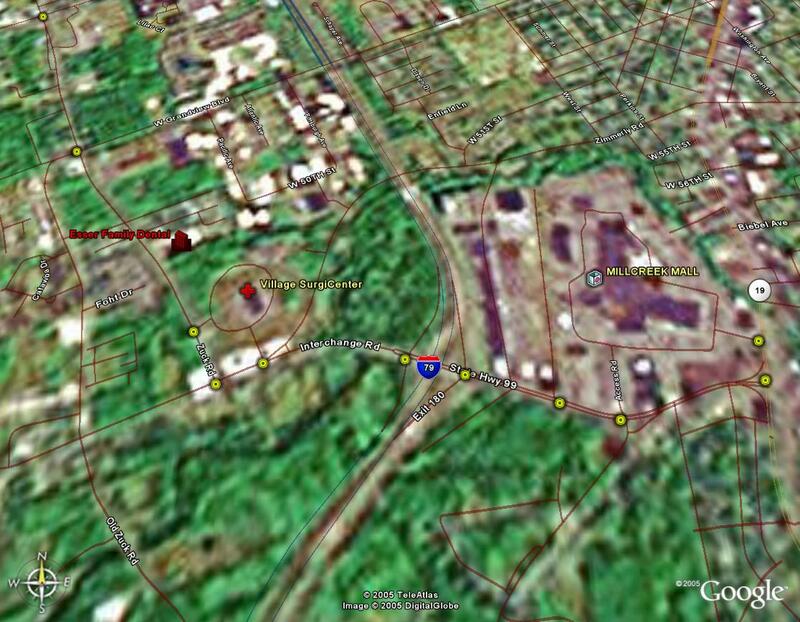 Satellite view of our location courtesy of Google Earth. Please note that if you use MapQuest to get directions, the written directions are ok but the star indicating our location is WRONG if you enter our address! We've notified them several times to change this without any results! Click Here for an accurate MapQuest map (It uses our latitude and longitude). Serving patients from Erie, Millcreek, Fairview, Girard, McKean, Edinboro, Waterford, Harborcreek, Union City, Cambridge Springs, Ashtabula, Conneaut, Meadville, Franklin, Oil City, Corry, Warren, Jamestown, Chautauqua, and every where in between since 1993. © 2019 Dentistwebtemplates Powered By EZ SiteLaunch LTD. All Rights Reserved.